The Today Programme, chip-and-pin credit cards and overhearing someone say, "Cheers Mate!" Proper blackbirds, proper robins - and - I never thought I'd say it - this chap.. 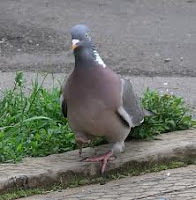 I've never seen a wood pigeon in America, or, more to the point, heard one. Only, tantalisingly, mourning doves..
Tantalising, as their coo sounds like an honest British wood pigeon's, but with the end alarmingly left off, as though they're being throttled. They always make me feel a little homesick.